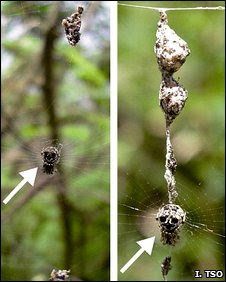 There is a species of spider that builds models of itself, which it uses as decoys to distract predators. Sometimes real life is better than our imagination. I was going to write up my homage to Cyclosa mulmeinensis for Swords & Wizardry, but after looking, I think it would pretty much be the Giant Spider 4ft radius. Maybe that's why it gets surprise 5 in 6, because characters are busy hacking away on it's webby decoy. Isn't it? Makes me think I should go surfing wikipedia for monster ideas. Wow. I've never heard of such a thing.